Man-of-the-match Elton Jantjies set up a debatable try to give Golden Lions a 26-19 away win over fellow South Africans Southern Kings on Friday in a Super Rugby relegation play-off over two legs. Replays suggested fly-half Jantjies passed forward on 66 minutes for outside centre Stokkies Hanekom to score his second try of an error-strewn game. Jantjies converted from almost in front of the posts at Nelson Mandela Bay Stadium in the Indian Ocean city of Port Elizabeth to push the Johannesburg-based Lions 12 points ahead. The visitors were reduced to 14 men soon after as inside centre Dylan Des Fountain was sin binned and the Kings cut the deficit to seven points when lock Steven Sykes barged over. But the home side could not capitalise on the numerical advantage again and face an uphill second-leg task at Ellis Park on August 3 before an expected 40,000 crowd. The Lions, demoted from the 2013 southern hemisphere championship to accommodate the Kings, earned four points for the win and the losers one for failing by fewer than eight points. Were the sides to finish level on points after the return game, overall points scored and then tries scored would come into play to determine the victors. The winning team will represent South Africa in the competition with the Northern Bulls, Central Cheetahs, Western Stormers and Coastal Sharks. 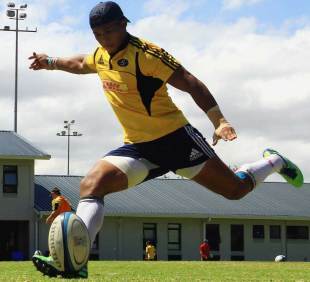 Jantjies, back at the Lions after a largely unhappy loan spell at the Cape Town-based Stormers, succeeded with six of seven shots at goal. He kicked four penalties and converted the first try by Hanekom, who dashed clear after an intercept, to leave the Lions 19-14 ahead at half-time before a 27,358 crowd. Kings fly-half Demetri Catrakilis was almost as successful from place kicks, landing three of five before forced to retire injured just before the hour mark in perfect playing conditions. He slotted three first-half penalties, made a try for left-wing Marcello Sampson via a cross-field kick, and was unlucky to see another penalty attempt rebound off the post.